This is a curated list of characters in Unicode, that have interesting (and maybe not widely known) features or are awesome in some other way. The code points of the Unicode blocks Box Drawing (U+2500 to U+257F) and Block Elements (U+2580 to U+259F) cover most of your monospace command-line visualization needs. U+D800 to U+DFFF - surrogate code points. They are only reserved to ease UTF-16 encoding. U+FEFF ZERO WIDTH NO-BREAK SPACE - it’s name suggests, that it can be used like U+2060 WORD JOINER. And in fact the latter was introduced to inherit its semantics. This is because U+FEFF had become a special beacon called the byte order mark, that was placed on the beginning of some UTF-8 files. In complying software (including many text editors) this character is stripped from the start of a file and handled as metadata. In non-complying software (like the PHP interpreter) this leads to all sorts of fun behaviour. U+FFFD REPLACEMENT CHARACTER - when a character cannot be displayed (e.g., decoding an erroneous UTF-8 sequency), this code point steps into the breach. U+1D455 is missing. It would be an italic small “h”. It was not encoded, because it would be identical to the Planck constant ℎ (U+210E). U+FE0E VARIATION SELECTOR-15 - force black-&-white emoji. If this code point follows an emoji, an explicit monochrome rendering of the emoji is requested (if the client supports it). U+FE0F VARIATION SELECTOR-16 - force colorful emoji. If this code point follows an emoji, an explicit colorful rendering of the emoji is requested (if the client supports it). Diacritics and combining marks: There is a host of characters, that add to the characters before. Those are called Combining Marks. Unicode provides a handy FAQ on the details, but in a nutshell: If you add one after a character, it is placed on top of that previous one. So, a + ̊ = å. This may lead to all kinds of funny problems, because for some combinations there are pre-composed characters. Our little å here can also be encoded as U+00E5. You might note, that while this has a length of one character, the combination of a and combining ring has a length of two characters. Of course, one can also do fun things with those characters like this answer on StackOverflow. U+00A0 NO-BREAK SPACE - force adjacent characters to stick together. Well known as &nbsp; in HTML. U+00AD SOFT HYPHEN - (in HTML: &shy;) like ZERO WIDTH SPACE, but show a hyphen if (and only if) a break occurs. U+200B ZERO WIDTH SPACE - the inverse to U+00A0: create no space, but allow word breaking. U+200D ZERO WIDTH JOINER - force adjacent characters to be joined together (e.g., arabic characters or supported emoji). Apple uses this to compose some emoji like different families. U+2060 WORD JOINER - the same as U+00A0, but completely invisible. Good for writing @font-face on Twitter. Smashing Magazine featured a comprehensive article on the different types of whitespace. U+0000 <control> - first code point. U+10FFFF (non-character) - last code point. 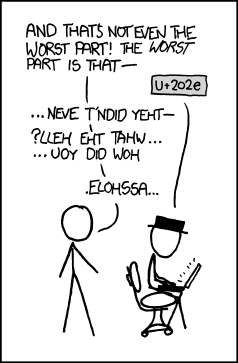 The whole rest of its plane apart from U+10FFFE, the code points in the 0x10000-0x10FFFD range, are private use characters, guaranteed to be never filled by a future Unicode standard. U+1F402 OX - shortest name. U+FBF9 ARABIC LIGATURE UIGHUR KIRGHIZ YEH WITH HAMZA ABOVE WITH ALEF MAKSURA ISOLATED FORM - longest name: 83 characters. U+FDFA ARABIC LIGATURE SALLALLAHOU ALAYHE WASALLAM - longest decomposition form: 18 characters. U+5146 and U+16B61 - code points that represent the highest “single-digit” number. In both cases that’s 1,000,000,000,000, a trillion. U+0F33 TIBETAN DIGIT HALF ZERO - code point that represents the lowest “single-digit” number and at the same time the only negative one, -½. The trophy for most useless code points goes to U+0080, U+0081 and U+0099. These so-called C1 control characters are more or less unspecified. They got into Unicode, because they were present in the very first version of what should later become ISO 10646, the ISO-standardized version of Unicode. They were meant to be part of an upgrade to ISO 2022, that never came to be. U+006F LATIN SMALL LETTER O - leads the list of characters with confusable shapes. Of all the possible mappings in the list of confusable characters, the small “o” leads with a whopping 73 entries of similar looking glyphs, followed by U+006C LATIN SMALL LETTER L with 70 entries. U+1680 OGHAM SPACE MARK - a space that looks like a dash. Great to bring programmers close to madness: 1 + 2 === 3. U+037E GREEK QUESTION MARK - a look-alike to the semicolon. Also a fun way to annoy developers. U+1DD2 COMBINING US ABOVE - this is the most romantic code point. U+F8FF PRIVATE USE CODEPOINT - this private use code point is rendered as Apple logo on many Apple devices. U+1F574 MAN IN BUSINESS SUIT LEVITATING - A rather curious character, that only made it into Unicode for its appearance in the Webdings font (for reasons of backwards compatibility). U+2800 BRAILLE PATTERN BLANK - A Braille pattern that has zero of its six or eight dots filled in. According to the standard: “* while this character is imaged as a fixed-width blank in many fonts, it does not act as a space” Essentially it is rendered as white-space, but since it is designated as not white-space it isn't matched by white-space-validating regular expressions. This can be used to bypass all kinds of validation that disallows or trims white-space. Card suits and even a whole deck of cards complete with joker and back of card. Die faces and a nice die emoji. Shogi pieces, a Japanese variant of chess. See the contribution guide for details. To the extent possible under law, the contributors have waived all copyright and related or neighboring rights to this work. See the license file for details.